Most entities in EVE are hell-bent on conquest or killboard stats or the pursuit of money. The New Order is different. We're all about building people up and helping them grow, by giving them the tools and the confidence that they need in order to become productive members of our new highsec. We're not so much building an empire as we are building a society. "No miner left behind" is our motto. Meet Mine Teck. He's Danish and occasionally has difficulty communicating with others. He's also a carebear. But none of that is going to stand in our way. Mine Teck has flirted with joining the resistance, and frequently causes disruptions in Kamio local. Lately, he's moved out of the rebel camp and onto the fence. He could go either way. Unfortunately, he's been having difficulty following the Code. That's where the New Order's loyal Agents come into the picture. Agent Dr Tyler and a few others invited Mine Teck to a TeamSpeak channel where they could figure out what the problem was, and hopefully, to solve it. In the process, our Agents were able to defuse a potentially volatile situation, and helped Mine Teck learn more about the Code. Another win/win for the good guys! 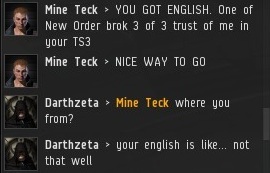 A peace conference on TeamSpeak is just another way the New Order performs outreach to the highsec community. Conferences may be recorded for quality assurance. "Run where I has when I pick up strawberry." - Mine Teck, 2013. The strawberry's definitely won the day! "I'm gonna kill them like Dirty Harry!" I like this because it is 'get the foreigner'. But I do question whether a prospective CSM representive should be posting such things after all the Mattani got banned for saying something silly. Here you are publishing conversations of 'entrapped' individuals, which some would consider to be worse than a silly drunken outburst at fanfest. This is still your CSM platform blog isn't it? People in nullsec have been publishing recordings of voice comms since the dawn of time. If it's suddenly not okay to do it because the person is an angry carebear I don't know what. Good thing the person behind the James 315 persona hasn't broken EULA or TOS, huh? While it may be confusing to 'bears, in-game behavior is not real life behaviors. I think what Bobbins is getting at is that a guy that runs a blog making fun of people that don't like his tactics might not be CSM material, especially given the last sentence of his quote. The key point is 'but should also set a behavior standard for everyone else to follow.'. No one said anything about breaching the eula or tos which the new order seems obsessed with. If you wish you may quote a ccp official saying that recording voice comms and publishing them in order to humiliate another player is a standard ccp would endorse. I do set a behavior standard for everyone else to follow. In fact, I codified it. Posting audio for one reason or another has been going on in EVE for a long, long time. As i peruse the recording, James wasn't even involved in the actual production. The way it looks, he's reported on an EVE event that has generated some content in the world. I had spent quite a bit of time helping folks in rookie chat while this character was skill-ing up. The moderators there appreciated my help, and complemented me for giving the newbies detailed explanations of exactly how CONCORDDOKKEN mechanics worked, something that the tutorials completely missed. Bobbins ... The Mittani got booted for egging on an IRL suicide threat. 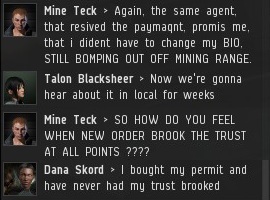 If they had all followed procedure instead ( complete the in game action that prompted the threat, petition CCP about the threat, and say nothing further to him ), the suicidal person would have been excluded from EvE Online until he produced a note from a local doctor. This has absolutely nothing to do with normal In-game play, and ganking is normal in-game play. Mine Teck chose to speak about game actions on our voice service, so his speech became fair game. Be rest assured, Bobbin, if Mine Teck threatens suicide, we will say nothing more to him, silently explode his ships, and report the suicide threat to CCP, who will ban him until he gets them a note from a local psychiatrist. The reason the Mittani got banned was that adverse publicity was directly against Eve on the back of his mistake. Due to the visibility of CSM members I would expect CCP to take an interest in any activity that could be negative percieved by external entities. Funny that I though newbies would be more upset about the New Order blowing up their ships and you should have recorded them on soundcloud to prove how helpful you are. Fact this is being posted in order to make fun at this guy. There was no reason to publish this private convoy other than to create amusement at his expense. It is cyber bullying and not something that anyone should be proud of. By recording TS whit out asking me. I think is is against the law, and then publish it. Again whit out asking. What in the HELL are you doing!?!?!? I am a happy investor this morning. So...March 1st is here. Are your NO ships flaming wrecks yet? LOL I'm guessing not. I checked NOLs war history for lulz and saw Flower Revage Cartel had decced you guys recently and the only 2 ship losses in the war were that blood valentine guy and Szlam. I guess he's not so fearsome afterall...I'm shocked SHOCKED!! Love is what the Ministry of Love does! This is so trashy, putting people down coz they dont speak and understated perfect English! No one is perfect not you not me no one is! What or who are you people that gives you the right to pull others down like that, are you better then every one els!?! Get a real life for a change it will help you! They put him down because of his language? I don't ever remember them putting him down in any way. As a matter of fact, they were trying to help him. Because YOU think he's bad at language doesn't mean they were putting him down for it. Sorry not only him but others too, making fun of them coz they dont understand what they are on about! For example they New order come in a system and say to the miners pay up 10mil or get ganked killed, then the miners after they got ganked killed start to say things like f u and p off, then a comment from the New order watch your langwich this is a Familie game but you still have to pay us 10mil or get killed! So they are two faced saying one thing and going another, what is worse the F or P word or to to say your going to die in a Familie game!?! You do understand this is a game and the term "killed" refers to blowing up of an imaginary spaceship, right? The "f u' and "p off" comments are not imaginary but are personnal attacks. Please try to get a grip on what's going on please. langwich - does that come with bacon? Danish bacon is excellent, BTW. They would report on anybody who is of equal to the person from TS, regardless of language capabilities. They're not just singling this guy out, they do these kinds of things with a lot of people. Also, if you're so concerned about people getting blown up because they don't understand, why don't you be an interpreter? You could translate their requests to other languages so then nobody has to be left out of the loop! 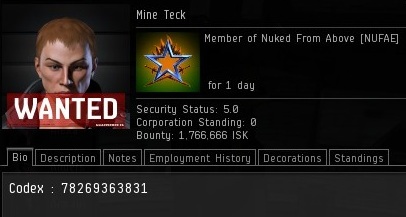 Last night, while peacefully bumping miners in Kamio, the resistance, in the form of Mine Teck, put the "Mark of Strawberry" on me and attempted to gank my SFI. In a Condor. The action was swift. MT locked onto me and suddenly, well, not suddenly. He locked on to me and after I pounded him with fireworks for several minutes, he opened fire! I remember thinking "What the hell is he doing?!?!?" I feinted to the north, laying down a defensive field of fire. I then pulled the patented "invincible Stabber" maneuver on him. With my shields down to 98% I held on, both to my ship and my bladder. CONCORD finally arrived and I was saved! I was rewarded with a kill and a kill right. And no, you cannot have my kill right. I do need to know... WHAT IN THE HELL ARE YOU DOING?! LMAO Hose and Bucket technique! I LOVE IT!! HAHAH, great audio! I have been following you all for a while, this is by far my favorite blog. Just created an alt today and training up to join the fun and enforce The CODE. 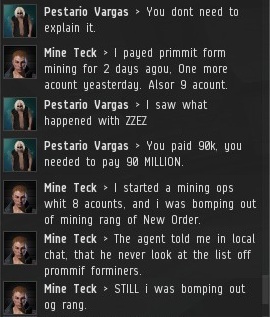 Never AFK min and pay for a mining/salvaging license.